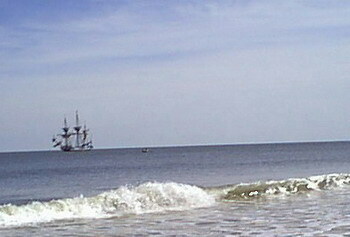 Welcome to all those interested in Pirate Living History and Pirate Reenacting! On these pages you will find information helpful to those people interested in historical clothing and equipment for Late 17th and Early 18th Century seamen. 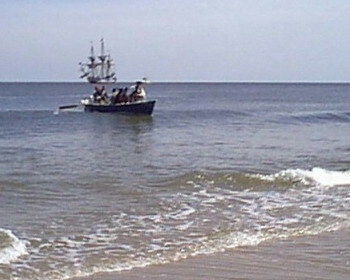 This site was crafted by Pirate Reenactors for Pirate Reenactors! I have finished over half of the website update. It has been a monumental task (at least for me) converting my hodgepodge-cobble-together site into a seamless easier to maintain version using CSS. Most of the major renovations have happened, however, not all the pages have been updated to the new format yet. Its coming, I just need some more time. I should admit upfront that I am not a professional web designer, and as this is a HOBBY, I can only devote the limited amount of time that the "Warden", aka My Wife, will allow. That being said, I am pretty proud of my little bit of cyber real estate as I feel that THERE IS NOTHING LIKE IT ON THE WEB. Most sites rehash the same old hoo-haz about fill-in-the-blank famous pirate, with little to distinguish itself from other sites. So if you want "general" information on the history of piracy in the 18th century, this ain't the place. But, if you want nitty gritty details about how a sailor/pirate would have looked in 1711 (or any time from 1680ish to 1720ish), than look no further. You can navigate through the waters of these pages in a couple of ways. At the top left (in a blue table) of every page, there are the major categories of this site. Each one of the major categories has a number of subsections for you to explore which you can get to via the navigation bar that runs down the left side of each page. The navigation bar has a graphic with description that when clicked, will link you to a page that discusses that item in detail. ...and want to expand your horizons about what historical pirates were. Kudos for not taking Hollywood's word for it! You should find a lot of interesting info on these pages, and, if you have specific comments or questions, each page "should" have a link at the bottom that enables you to contact us. You can send us your comments, criticisms, atta-boys, and even the "you are a frggin idiot!"s. I am always looking for new and pertinent information, so if you want something clarified, feel something is missing, or have your two cents to add, please drop me a line. Drop me a line and let me know. I will try to return the favor as soon as I can. Lastly, this site is a healthy mix of original material, and that which has been collected here and there over the years. A special thanks goes to the folks in re-enactment groups, forums, and e-mail lists that I have worked with to try to get the best information currently available. I try to give credit where its due, and if I have used pictures from another site, I have embedded the URL of the site I where got the picture from or have captioned the graphic with the artist or place where it has come from. If I have "borrowed" something from your site and have not given credit, please contact me as I will make amends as soon as possible. At the same time, if you have used this site to help fluff up your own piece of cyber space, please, do me the courtesy of at least acknowledging my site on your links page. I can't tell you how often I come across "my own stuff" on other people's websites and then find that they haven't even include Gentlemen of Fortune on their links page. I am not sure whether it is a guilty conscience or what, but please, don't be a jerk. If you are here to get as much from my site as you can, please try to link back here and share the love. Historical Pirate interpretation can be a sticky wicket, as there are a lot of grey areas where theories have yet to be proven (or disproved). Debate rages on while new information rears its head from time to time. This site tries to reflect what is currently "documentable" for the GAoP. That means, while something "may have" existed, if it cannot be proven via period artifacts, documentation, or period images, than its not going to make it to these pages. There are a lot of myths that are held as the truth, and things taken for granted that just don't hold water under close scrutiny, and they are cast to the wayside here at GoF. We, at Gentlemenoffortune.com, like to grill the occasional fantasy pirate sacred cow now and again, so bring your favorite barbeque sauce and lets get started! I want to say, "thank you" to all the folks that have helped me get the original site up and functional, and those that have help with the rebuild. Whether you were an antagonist on a pirate forum, a newbie with a fresh perspective, or an ol' salt who allowed me to pick your brain, this site wouldn't be here if it wasn't for you. Also, a special thanks goes to Danielle for giving me the time, and to C.A Salone for help getting this to look respectable! The hosting and maintenance of the site is considerable in time and money. To keep my wife off my back, its nice if my "hobby" can pay for itself. Thus, I have several hot links to the Pirates Library, where if you buy the book at the linked Amazon.com site, Gentlemen of Fortune gets a small fee for referrals. Its small, but, if you are going to buy the book anyway, this is a great way for you to help us out. Also, Gentlemen of Fortune has a few products for sale which you can check out in the Slop Store, or in the sections that discuss the item.